Bayern Munich overturned a poor away leg result with a convincing performance at the Allianz Arena. Pep Guardiola made one change to the side that suffered a defeat at the Dragao, introducing Holger Badstuber alongside Jerome Boateng at centre back. Julen Lopetegui was without his first choice full-backs, which saw Diego Reyes and Marcano slot into Porto’s makeshift back-line. The Portuguese club’s front six was unchanged. This was the antithesis of Bayern’s performance at Dragao, as they comfortably monopolized possession, whilst focusing on width to create chances. The most interesting feat prior to the second leg was whether Porto would replicate the effective pressing that thwarted the Bavarians at Dragao. In Portugal, Lopetegui’s side pressed in phases out of possession, but here, the away side displayed considerable caution by dropping deeper into their half when Bayern surged forward. Jackson continued to position himself goal-side of Xabi Alonso to prevent service into the Spaniard, along with preventing him from dictating the tempo from deep. Ricardo Quaresma and Yacine Brahimi moved towards the Bayern fullbacks, with only Hector Herrera pushing forward to aid the front three. For the most part, Lopetegui’s makeshift back four weren’t keen on surging into advanced areas, and Porto often sat deeper in a 4-5-1 with the wingers pegged back due to Bayern’s adventurous fullbacks. The Porto wingers couldn’t dribble away from pressure, and with two makeshift fullbacks – who are natural centre backs – the decision to play a highline would be too risky. 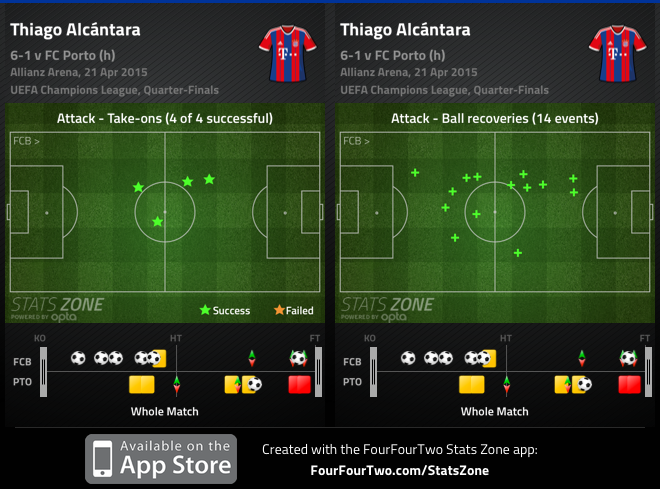 However, the main talking point surrounded Bayern’s set up. In the first leg, Bayern’s 4-3-1-2 deprived the German side of natural width, and they equally encountered difficulties getting service into their attacking players. Guardiola reacted to Bayern’s insufficiencies at Dragao by moving to a natural 4-4-2 with Phillip Lahm and Mario Gotze as wingers, while Lewandowski and Muller formed a natural strike partnership. Lahm aimed to combine with Rafinha and Muller, whereas Gotze stuck wide and drifted infield to create space for Bernat to surge into. Both elements of width were non-existent in the first leg, enabling Porto to congest central areas and easily regain possession. Here, their initial shape was stretched, which presented more gaps for the likes of Thiago and Alonso to play into. But with both men faced with the task of evading Porto’s pressing in midfield, Badstuber and Boateng continuously pinged passes into wide areas. Ultimately Gotze and Lahm’s wide positioning benefitted Lewandowski and Muller, as they effectively thrived as a natural strike duo. Lewandowski, renowned for his ability to operate as a poacher and a player to drop deep, was at his supreme best here. Apart from the goal, Bayern’s best moves were created from the front two’s movement – Lewandowski would drop deep, whereas Muller would charge into the space behind the Porto defence. Bayern’s first legitimate chance was a prime example. Lewandowski dropped to the centre circle to receive service, and subsequently flicked the ball into space for Muller, thus leading to Fabiano making a good save, and the Pole hitting the post. 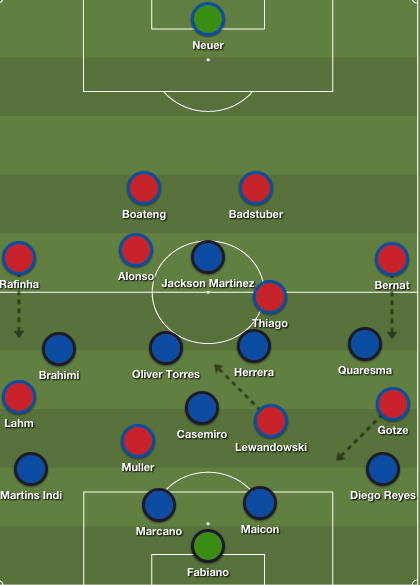 Although a traditional 4-4-2 is quite simplistic in the modern era, Guardiola’s alteration solved the main attacking issues Bayern faced in the first leg. Lahm and Gotze’s width created space for Alonso and Thiago to control the game in midfield, whereas Muller and Lewandowski operated as a classic strike partnership and attacked crosses into the box. Bayern’s superiority was evident throughout the first half, and width was equally crucial in the buildup to their goals. Coincidentally, their lone away goal in the first leg stemmed from a Boateng cross, and in the first half, Guardiola’s men continuously launched balls into the box. Initially it was Rafinha’s over hit cross that fell to Gotze, and his lay off to Bernat saw the Spaniard run past Quaresma to deliver a devastating ball towards the near post, which Thiago nodded past Fabiano. Badstuber and Boateng rose high to combine, as the latter nodded in Alonso’s cross from a short corner for Bayern’s second. Still, it was the third goal that epitomized their approach. It was a truly superb goal that witnessed a 26 pass move conclude with a wonderful Thiago diagonal to the right flank and three magnificent first touches: Lahm instantly delivered the ball into the box, and Muller directed it into the path of Lewandowski who finished superbly. As expected, the Bayern dominated possession, but Porto couldn’t cope with countless crosses into the box, which epitomized Guardiola’s successful tactical modification. Both managers reacted to Bayern’s first half onslaught with caution: Ruben Neves replaced Quaresma as Porto transitioned into a 3-5-1-1 with Brahimi behind Jackson. Porto’s additional ball playing midfielder helped the away side enjoy longer spells of possession – Bayern’s pressing decreased – while the wingbacks pushed higher up the pitch to prevent Bayern’s fullbacks from storming forward. Porto’s changes were made to gain control of the match through possession, and direct balls into Jackson led to a goal and great chance shortly afterwards. 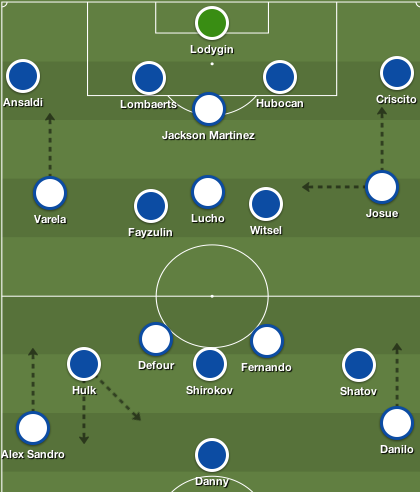 Jackson was still isolated upfront, and though Herrera assisted his side’s sole goal, the Mexican and Brahimi rarely combined with the Porto striker. Bayern’s intent to close the match out through possession saw Guardiola move to a 4-3-3 with Lahm moving into midfield. Yet, Bayern’s best chances prior to Jackson’s consolation goal stemmed through deliveries from the right flank. The German outfit won the tie with a terrific first half performance, and the final 45 minutes were merely based around preventing further embarrassment. Bayern were heavy favourites to mount a comeback in the second leg, and this was a truly remarkable display. Surely Porto displayed increased caution and pragmatism in comparison to their first leg triumph, but this was more about Guardiola altering the mistakes made in Portugal. Put simply, Bayern focused on width and crossing to overturn the first leg result: it was a simple, yet effective approach. This was another example of Bayern’s augmented flexibility and evolution under Guardiola. Luciano Spalletti was confident in his side’s ability to earn a victory at home against FC Porto. Apart from Spalletti’s peculiar comments on obstacles and weather conditions, the Zenit manager believed quality would outshine tactics. “When both teams have a number of talented individuals, then it is not the tactical nuances that decide the outcome but how the key players perform. The result will also be determined by the mentality and the team spirit shown,” Spalletti said. Spalletti’s comments were peculiar, but when Norwegian referee Tom Harald Hagen blew his final whistle at the Petrovsky Stadium, his prediction was justified. Porto was dominant for majority of the first half, as they continued to implement their high-pressing game, and Zenit were unable to settle. Axel Witsel and Viktor Fayzulin couldn’t get a touch on the ball as Porto quickly circulated passes around the Zenit midfield, and Paulo Fonseca’s men worked twice as hard to retain possession, when they gave it away cheaply. Fernando and Steven Defour glided between the Porto centre backs to receive the ball and continuously build plays, and Zenit didn’t attempt to pressure the midfield duo as they dictated the tempo of the match. Surprisingly, Zenit’s shape without the ball was disjointed. There were large gaps of space between the lines for Josue and Lucho Gonzalez to slide into to receive the ball. While Jackson Martinez enjoyed his best spell in the opening hour, dropping deep to link play and making intelligent diagonal runs. 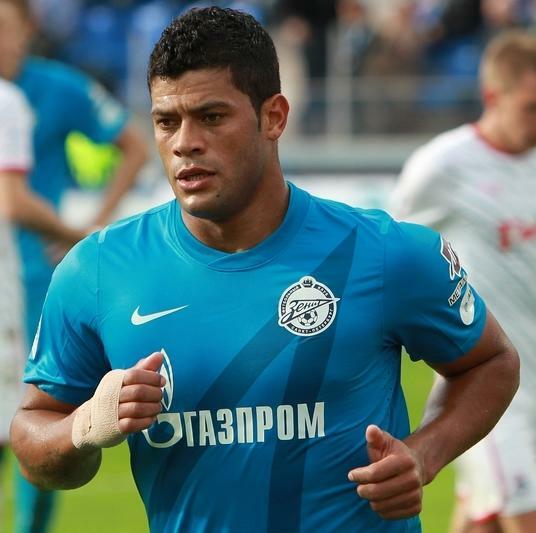 The most alarming feat was the tactical naivety from Hulk and Oleg Shatov, who completely ignored their defensive duties. While this could’ve been Spalletti’s aim to hit Porto on the counter, it was nearly suicidal, as Alex Sandro and Danilo – arguably the best fullback duo in Europe – constantly drove into advanced positions. Varela and Alex Sandro shared Porto’s highest pass combination throughout the match, whereas Danilo’s cross from the right flank created Lucho Gonzalez’s terrific headed goal. However, Porto’s lead was short-lived as their back four was responsible for their second mental lapse in the span of four days. Zenit’s first patch of composed possession resulted in Domenico Criscito combining with Witsel, who back-heeled the ball to Roman Shirokov. Shirokov’s heavy touch guided the ball into the 18-yard box, and an unmarked Hulk pounced on the loose ball, and rounded Helton, thus handing Zenit a fortuitous equalizer. Despite Porto’s superiority in possession, Zenit gave the Portuguese champions a few scares on the break. Considering the Russian side’s inability to move forward as a unit and Porto committing men forward, this was a risky, yet logical approach from Spalletti. In the eighth minute, Shirokov played a simple ball over the top of the Porto defence that Hulk latched onto, and the Brazilian squared it to Witsel, who fired his shot over the net. Approximately 30 minutes later, Hulk triggered the break as he played a simple straight ball into the right channel for Aleksandr Kerzhakov. The Russian striker played a ball to the edge of the box for Shatov, and the Zenit midfielder squared it onto the path of Fayzulin, who fired his shot directly at Helton. Fonseca was aware of Zenit’s legitimate threat on the break, but the Portuguese manager failed to adjust his shape in the second half to prevent being overrun in midfield. Zenit approached the second half with more energy and belief and they began to press Defour and Fernando, while their shape in midfield gradually improved. Lucho and Martinez were peripheral figures, as Porto penetrated wide areas for the remainder of the match. The main issue with Porto’s shape was they committed so many men high up the pitch, and they were unable to retreat into position during Zenit’s quick transitions on the counter. Although Danilo and Alex Sandro possess great threats out wide, there’s no need for both fullbacks to push forward, whereas Lucho should’ve dropped deeper to assure Porto’s dominance in midfield. Zenit’s second half resurgence was highlighted in the 50th minute, when Shatov closed down Nicolas Otamendi and deflected his pass towards Shirokov, in Porto’s third. Shirokov played in Shatov and his attempted cross hit Otamendi in the hand, earning Spalletti’s men a penalty. Shockingly, Hulk stepped up to the spot and hit a tame shot that Helton comfortably saved. With 30 minutes left in the match, Porto’s press diminished due to fatigue and Zenit’s threat on the break increased. Alex Sandro brought down Hulk, after Tomas Hubocan drove through midfield from his 18-yard box and played the Brazilian winger free. Then Hulk turned provider and played another ball into the right channel for Kerzhakov, who fed Shatov, and this time he back-heeled the ball to Andrey Arshavin, who was denied by Helton. 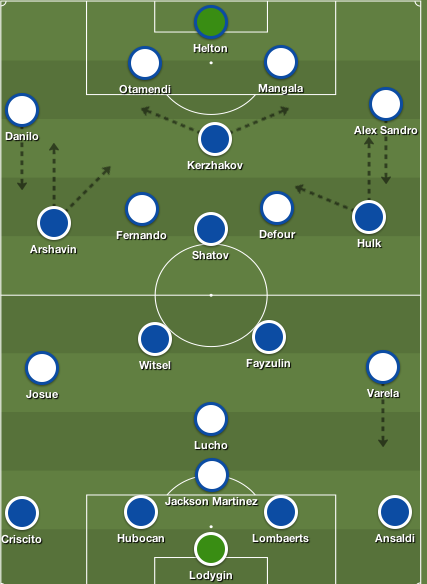 Fonseca made attacking player swaps to implement a larger threat in the final third, but Porto’s approach was unchanged. On the other hand, Spalletti’s decision to introduce Arshavin was positive, as it led to more activity in Porto’s third. The Russian winger played clever passes and crosses in advanced areas, produced penetrating runs on the left flank, and displayed a bit of trickery, whilst helping his side maintain possession. Zenit were denied a stonewall penalty in the final minutes of the match when Arshavin drove at the heart of the Porto defence and played in Hulk, who got a yard ahead of Eliaquim Mangala with a step over, and was pulled down inside the box. Porto spent majority of the second half trying to create chances from wide areas but the quality from their wide players was poor. Fonseca witnessed his side over commit players in attack, and were fortunate not to concede a goal on break, as Helton made a few key saves to preserve the draw. It’s been a recurring theme in Porto’s season thus far – Start the match with intense pressing and dictate possession, but slowly fade away in the latter stages when energy levels dip, leaving them vulnerable against counters, due to a lack of natural balance. Fonseca’s tactical shrewdness was anonymous as he watched his key players fade in the second half. Performances of this stature should worry Porto fans that demand better performances in Europe’s most prestigious tournament. More so, this result sets up an interesting conclusion to Group G, as second place is still up for grabs. Tyrrell Meertins is joined by Toronto journalist Victor Ferreira, as they break down Porto and Benfica’s season thus far, ahead of their monumental title-deciding clash at the Dragao. We also shed some light on AVB’s first season at Tottenham and Pacos Ferreira’s miraculous run in the Liga Sagres. Subscribe to the 2 Guys and a MIKE podcast on iTunes…NOW! Tyrrell Meertins is the only man in the studio today, and he briefly breaks down all four Champions League fixtures that took place this week. Enjoy! Malaga overcame a 1-0 deficit in the first leg to defeat 10-man Porto, and becomes the third Spanish team this season to advance to the quarter-finals of the Champions League. Manuel Pellegrini opted to line his side up in a 4-2-3-1 like he did in the first leg. Pellegrini went with Javier Saviola instead of Roque Santa Cruz, while Isco, Julio Baptista and Joaquin played behind him. Manuel Iturra and Jeremy Toulalan were in charge of shielding the back four. Vitor Pereira preferred to assemble his side in a 4-3-3 with Jackson Martinez leading the line, while Varela and Steven Defour were on the flanks. Pereira’s midfield three consisted of Joao Moutinho, Fernando, and Lucho Gonzalez. The only change from the first leg was Defour on the left in place of Marat Izmailov. The game for the most part was cagey, and Porto dominated the opening 20 minutes. They kept an extremely high line and they pressed well as a unit, which forced the Malaga players to concede possession. Pellegrini’s men were unable to settle, while Moutinho and Lucho’s energy in the midfield pushed Porto forward but they were unable to create goal-scoring opportunities. Another interesting feature in this match was Alex Sandro and Danilo getting forward because Isco and Joaquin ignored their defensive duties. Isco stayed higher up the pitch looking to break on the counter, while Defour drifted centrally allowing Alex Sandro to burst forward. Their runs caused Pellegrini’s men several problems in the opening 20 minutes. Porto’s high line left them vulnerable to balls over the top, and they nearly were exposed on three occasions. Joaquin, Saviola and Isco were all ruled offside when balls were sent over the top. Eventually Pereira’s men tired from pressing, and it allowed Joaquin and Isco to become more involved in the game as they drifted centrally. Porto lacked invention in the final third and constantly conceded possession, which also played a part in Malaga taking control of the game. Malaga was the better side for the second part of the first half, and they were denied a Saviola goal. Danilo pushed Baptista into Helton and Saviola tapped the ball into the net, but the officials believed Baptista fouled Helton. Minutes later, Isco gave Los Boquerones the lead when his strike from outside the box left Helton humbled. It was a scrappy first half that saw five yellow cards issued, but Isco’s opener displayed the quality that both sides lacked over the two legs. Porto were forced to make changes in the second half, James Rodriguez replaced Moutinho, who couldn’t continue in the match due to an injury. Defour went into midfield, while James moved out to the right flank. Four minutes into the second half, Defour received his second yellow card for a clumsy challenge on Joaquin. Defour probably wasn’t the best option to play in this game, but he did drift centrally to provide another passing option and he linked up with Martinez on a few occasions. Throughout the match Martinez was an isolated figure, Porto struggled to link up with the Colombian striker and he was handled well by Martin Demichelis and Weligton. When Porto went a man down, they dropped into a 4-4-1. Pereira brought on Maicon to strengthen the back, and with Sandro tiring in an advanced position, Christian Atsu was introduced. 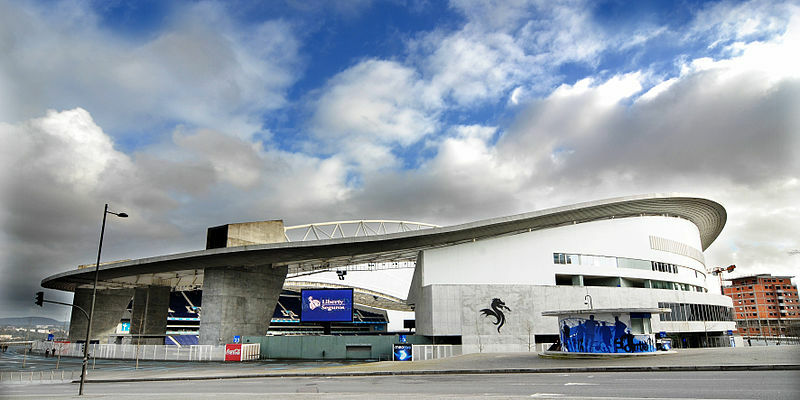 Porto sat deeper in two banks of four as Malaga began to dictate the game, and they defended well. Malaga struggled to unlock the defence, and like the first half, they lacked a final ball. It was no surprise that their goal came from a corner kick, and it was substitute Santa Cruz that nodded home the aggregate winner. Pereira’s men had a few chances towards the end of the match to nick an away goal when Malaga sat deeper, but they failed to convert their opportunities into goals. Over two legs the quality from both sides in the final third was poor, both sides failed to get in behind the opposing team’s defence and Jackson Martinez was fairly quiet. Pereira’s men failed to score and their high line early on always left them vulnerable to concede a goal. This team will have to wait for another season to get past the round of 16, and they’ll need to improve their performances away from home on European nights. Pereira has yet again stumbled in Europe, and his team selection, tactics, and his players’ discipline will be questioned after this result. Ultimately, his job will be in jeopardy if Porto fail to overtake rivals Benfica in their domestic league. Malaga’s fairytale run in this competition continues, and they progress from behind like Real Madrid and Barcelona has at this stage. Pellegrini on the night might feel fortunate, as Porto were favourites to progress prior to the red card, but on the night he outclassed Pereira tactically. Even with all the significant departures over the last 12 months, he still finds a way to get the best out of this side. Regardless of what happens in the next round, it’s results like this, that Malaga supporters will cherish forever. Jose Mourinho: How special is he? Whether he used 4-3-1-2’s, 4-5-1’s, 4-3-3’s or 4-2-3-1’s, these formations led Jose Mourinho to silverware. At the age of 49, Mourinho has arguably been the most successful manager in European football. Since joining Porto in January 2002, he’s won 20 trophies including two Champions League titles. Along with being one of three men to win the Champions League with two different teams and the youngest manager to win the trophy twice, Mourinho is also the only coach to win league titles in England, Italy and Spain. Former Liverpool manager Bob Paisley has done better in that span winning 20 trophies in his nine-year tenure with Liverpool in the 1980’s. Only Pep Guardiola has come close to emulating Mourinho’s record in modern day football by winning 14 trophies in his four years with Barcelona. Mourinho’s stats put him in an elite class, and for a man who referred to himself as the ‘Special One’ he’s certainly heading in the right direction, but despite all these achievements, is it possible that Mourinho is far from special? With all the success the Portuguese manager has achieved over the past decade, more owners are determined to lure Mourinho to their club. If you look at his stats they’re flawless, but one may gain the impression that the self-proclaimed “Special One” is nothing more than a very good short-term manager. With a winning percentage no lower than 60% and losing no more than 25 games in those tenures, Mourinho has only left a club in the middle of a season once, in which he enjoyed an eight-month sabbatical away from football. That club was Chelsea, and it occurred in Mourinho’s fourth season as Blue’s manager. After a loss to Aston Villa and draws to Blackburn and Rosenborg, Mourinho left Chelsea by mutual consent. Along with Mourinho having issues with Roman Abramovich behind the scenes, Mourinho’s Chelsea side was sitting in fifth place prior to his departure and finished his third season with the Blues six points behind Manchester United in second place. In that season Chelsea managed to pick up two domestic trophies, but was unable to defeat Rafa Benitez’s Liverpool side in the Champions League semi-finals or win the Premier League for the third straight year. At Porto and Inter Milan his tenures went smoothly as planned. He claimed his two Champions League crowns in his second full seasons in Portugal and Italy. With a backbone of Deco, Ricardo Carvalho, Costinha, Maniche, Vitor Baia and Benni McCarthy, Porto was able to achieve the club’s first treble in his first full season and claimed the club’s second European crown in his second year. It was then that Mourinho left the Portuguese club to manage in the Premier League at Chelsea. The following season Porto were unable to replicate their success without Mourinho; They were knocked out in the first knockout stage against Inter Milan and finished three points behind Benfica in their domestic league. Porto didn’t decline drastically due to the lack of competition in Portugal, but they did go through four managers in two seasons before steadying the ship with Jesualdo Ferreira. Mourinho’s time in Milan was again short, but he was the first manager to win the treble with an Italian team. The Inter Milan side he inherited had won the Scudetto three consecutive times but they were unable to replicate their domestic form in Europe. With Julio Cesar, Lucio, Walter Samuel, Maicon, Christian Chivu and Javier Zanetti, Mourinho was guaranteed solidity at the back. But with his first season signings in Ricardo Quaresma, Sully Muntari and Mancini not living up to their ability, Mourinho was forced to splash more cash, and he did. Thiago Motta, Diego Milito, Wesley Sneijder and Samuel Eto’o arrived at the San Siro in his second season, which led to another European triumph for Mourinho. A 2-0 victory over Bayern Munich in the 2010 Champions League final was Mourinho’s last match as he already had his eye’s set on taking over the helm at the Santiago Bernabeu. Since Mourinho’s departure, Inter Milan has gone through five managers and has been unable to find stability in results. Mourinho faced a daunting task upon his arrival at the Bernabeu, and that task was Barcelona. Arguably one of the greatest club sides to play the game with the likes of Lionel Messi, Xavi and Andres Iniesta dominating world football and cruising in La Liga. During his first season Mourinho was able to capture the Copa Del Rey from Barcelona, but he was defeated over two legs in the Champions League semi-final (First time Real Madrid made it past the 1st knockout round since 2003/2004) and finished four points behind Barcelona in La Liga. Madrid was a different breed in their second season under Mourinho as they dethroned Barcelona and won their first La Liga title in four years. Mourinho did it in style, breaking records, as Madrid scored 121 goals in the league, reached 100 points and earned 32 wins. They once again bowed out in the semi final stage of the Champions League to Bayern Munich and fell to Barcelona in the Copa Del Rey, but their league triumph was more than enough. Not only did Mourinho defeat Barcelona, but he also put an end to Pep Guardiola’s tenure. Guardiola was stepping away from football as he needed a ‘break’ and Mourinho had La Liga all to himself, or so we thought. And here we are now, quickly approaching 2013 and Jose Mourinho’s men sit 16 points behind Barcelona with his job in jeopardy. Issues on and off the field with the media/the board and reported bust-ups with Sergio Ramos and Iker Casillas have mounted pressure on the Portuguese manager. The question is, will Mourinho be sacked? Regardless of whether he’s sacked tomorrow or at the end of the week, it’s inevitable that Mourinho will leave at the end of the season. Is it the right decision? Now although Whittall does bring up some logical reasons behind why Mourinho should stay Madrid manager at the end of the season, is it possible that Mourinho no longer has much to offer at the Bernabeu? Never has Mourinho sat 16 points behind the league leaders in any domestic league since joining Porto in 2002. Yes I know he’s never came up against a side as great as Barcelona, but the sudden decline in this Real Madrid side is no fluke. Mourinho left Porto at the right time and what he achieved at the club in Europe may never be replicated again in modern day football. At Chelsea, he was allowed to spend approximately £225.76m and along with Manchester United in transition, Mourinho was able to claim two Premier League titles. As he went to Inter Milan and Madrid he continued to receive funding from owners who were determined to win and willing to give him the resources. Would Mourinho be able to succeed in a top league with limited resources? Could the problem at Chelsea and now Madrid be down to Mourinho overstaying his tenure? At Inter and Porto he achieved all he could in two years, but with Chelsea and Madrid he has claimed success domestically but his inability to win the Champions League has forced him to stay longer than expected. Thus allowing us to witness his sides decline rapidly. Is it possible that Mourinho physically and emotionally drains his players over a two-year cycle? Could Mourinho’s training methodology, tactical expertise and ability to motivate his teams have short-term effect? Is Mourinho’s impressive track record hiding his flaws? Can he sustain success for more than three years? Is he able to build/rebuild a squad and instill youth, rather than poaching world-class players that’ll get him results for the present? These are questions that have yet to be answered in Mourinho’s path to greatness, but they’re surely on his checklist. Mourinho’s final task to complete at Madrid begins at Old Trafford where his legacy began in the Champions League. It was in the first knockout round that his Porto side defeated Manchester United. Ironically nine years later he’ll face off against Manchester United once again in a match that could define his tenure at Madrid. Mourinho was brought in to dethrone Barcelona and guide Madrid to their 10th European title. Failure to do so, along with all the issues behind the scenes can put a dent in Mourinho’s reputation and be considered as a failed project by many. The most important factor in being a successful manager is winning trophies. The manner in how you win those trophies determines whether you’re a special manager. Mourinho’s poor results, failure to disband cultural groups in the locker room and avoid off field issues with the board/media have led to Mourinho’s downfall at Madrid. It also could be exposing Mourinho and showing his true colours. A decline in performances was transpiring at Chelsea, occurred at Inter Milan the following year and is now happening at Madrid. Mourinho is young and will only get better as he gets older and wiser. He is a great manager, but Mourinho is not ‘special.’ Yet!